Looking for the best Trastevere restaurants? So many places to eat, so little time. Do you want to waste it eating at a touristy place with bad food? Trastevere is considered one of the most charming neighborhoods in Rome. But finding really good restaurants here can be a challenge. Here's where to go! The neighborhood of Trastevere is pretty huge, encompassing three separate districts. So on this page, I've listed a lot of places that are literally all over the map. There are other Trastevere restaurants of course, and I'll update this page when I find a new one I love. But I can't list every single place, and in fact, I don't know them all. I'm just giving you my favorites of the ones I know. And that's still a lot. Enjoy! I’m not sure how Trastevere got a reputation for being the best area of Rome to eat in. 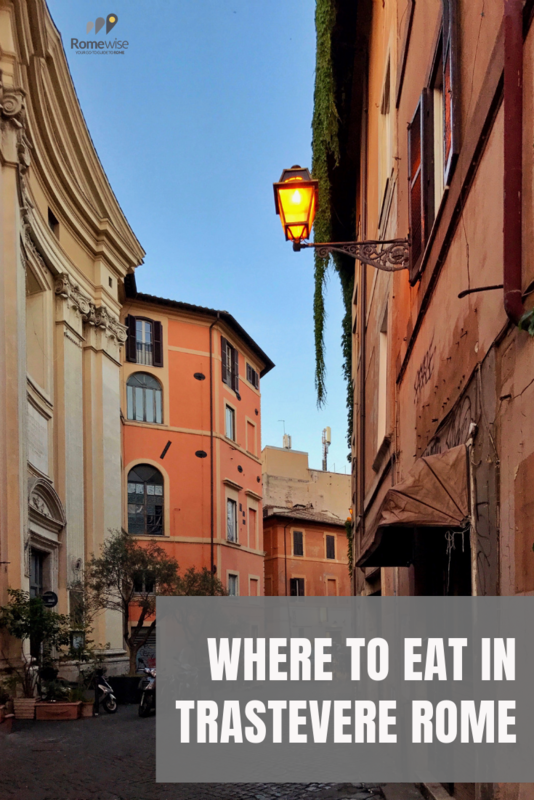 First of all, you can find great places to eat all over Rome. Second of all, Trastevere has more than its share of pretty bad touristy spots. But there are actually many wonderful Trastevere restaurants, if you know where to go. And I do. How do I know? Thanks to my Roman husband, Alessandro, who grew up going to Trastevere restaurants with his family for Sunday meals, and to my Trastevere pals Max and Walter, born and raised there and who run an amazing website and Facebook page dedicated to Trastevere, I have the inside scoop. Finally, I eat out in Trastevere restaurants a lot, so I can continue my research. Yes I know, tough job and all that. If you want to know more about Roman cuisine, visit my page here. I find most people want traditional Roman cuisine when they look for Trastevere restaurants. Even considering that Trastevere is known for having these "traditional Roman restaurants", they are not all created equal. There are the classic Trastevere restaurants that seem stuck in another era, serving excellent Cucina Romana (classic Roman cuisine). Da Teo is one of the first Trastevere restaurants my pal Max told me to try. And I've been going regularly since then. Da Teo is one of my favorite Trastevere restaurants for fried appetizers. This family-run spot is tucked away on a little piazza, and serves up some of the best traditional Roman cuisine in the area. You can eat inside or out. It is always packed, so book ahead, even for lunch. Details: Piazza dei Ponziani, 7A. Open Mon - Sat lunch & dinner. Closed Sundays. Phone: +39 06 581 8355. Outdoor dining available. Reservations essential. Tavernaccia da Bruno is one of the Trastevere restaurants on this page that is on the outer edges of Trastevere proper, but I include them here because they are worth making the effort to get there. This is the place for hearty, perfectly prepared, simple Roman fare. They get it right every time. Details: Via Giovanni da Castel Bolognese, 63. Open Thursday - Tuesday for lunch & dinner. Closed Wednesdays. No outdoor dining. Phone: +39 06 5812792. Reservations a must. My Trastevere pal Max told me this is one of his favorite Trastevere restaurants, and, after eating there many times, it's become one of my faves too. La Gattabuia is one of the Trastevere restaurants that I would call a bit off the beaten path. It's on the quiet side of Trastevere, on a quiet street. Once you find it, make sure to try all the typical Roman delicacies. Tuck in and enjoy! I love this fairly no-frills restaurant smack in the busy part of Trastevere, because they always keep it real. 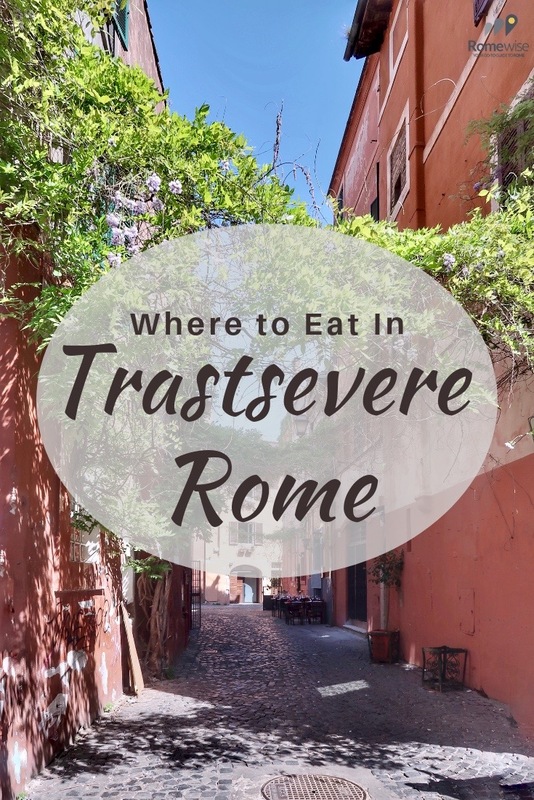 It may feel touristy, since it's right in the middle of the tourist path through Trastevere, but if you are looking for simple Roman fare, you will find it here. And when they make things like risotto alla pescatora (hard to find made really well in Rome), I get it here. Da Carlone is one of the more old-fashioned Trastevere restaurants. The ambiance is warm and convivial, the service is brisk but friendly, and the portions are pretty huge. I suggest sharing. Da Carlone is an excellent spot to enjoy traditional Roman Jewish fried artichokes. Here you will definitely find some of the best fried artichokes, carbonara (old-style, no crispy guanciale here! ), gnocchi on Thursdays, etc. They have a fairly cozy outdoor seating area as well. At Da Carlone in Trastevere, on Thursdays, you can find the classic Roman Thursday dish, gnocchi. In spring we had it with asparagus and mushrooms. Details: Via della Luce, 5. Open from Tuesday - Sunday lunch & dinner. Closed Mondays. Phone: +39 06 580 0039. Reservations a must. This simple no-frills traditional Roman restaurant is a perfect place to enjoy a casual, relaxing lunch or dinner. There's nothing fancy or innovative here, just your typical Roman dishes made well. Ai Vascellari is one of the traditional Trastevere restaurants where you can count on all the Roman classics like fried artichokes and amatriciana. You can count on perfectly made Roman dishes like fried artichokes, amatriciana, and saltimboca alla romana. I love their homey indoor ambiance. Details: Open Tuesday - Sunday for lunch and dinner. Closed Mondays. Phone: +39 06 5833 4628. Reservations suggested, or arrive early as they are always full. Outdoor seating available. Checco er Carattiere was the first of the Trastevere restaurants my husband recommended to me. Checco er Carrettiere is one of the most traditional of the old-fashioned Trastevere Restaurants. I think the garlic hanging from the rafters is an excellent touch (ok it's a little hokey but it's still cute). A caveat - The pasta prices are crazy expensive (18€ for cacio e pepe). However, the portions are also unusually huge. So,I suggest sharing, and the portion size and pricing will get to normal. One more caveat - a good friend who is a foodie and a local has told me she has had different treatment when there when she goes with Italians as opposed to being there with tourists. So don't worry too much about any brisk treatment by your server. Take it with a grain of salt. And enjoy the food. Checco is a Trastevere tradition, going back to the early 1900's. The original restaurant used to be the "it" place for movie producers and journalists to eat in Trastevere back in the day of La Dolce Vita (50's and 60's). It is still today run by the descendants of Checco, the original Carrettiere (which is argot for "tradesman"). You'll find delicious traditional Roman pastas (carbonara, amatriciana, etc. ); typical Roman meat dishes like veal piccata or osso buco; and classic Roman desserts like tiramisu and panna cotta. Checco er Carattiere is one of the best Trastevere restaurants for enjoying traditional Roman cuisine. But portions are large and the pasta dishes expensive, so I suggest sharing. Details: Via Benedetta, 10. Open daily for lunch & dinner. Reservations suggested especially during busy dates and weekends. Phone: 06 581 7018. Limited outdoor dining on a covered patio in the back. This may well be one of THE most "touristy" restaurants in Rome. And it's so much fun to eat here! And, the food is good. So am including them on this page. Where can we eat dinner in Rome where we can listen to live music? Where can we eat outside in a nice setting? Where can we go with a large group? Da Meo Pattaca is perfect for all of those requests. The live music is called stornelli, or Italian folk songs. It's very lively and they engage the audience/diners, especially if you are with Italians. When I have been with Italians, we all sing along, and the musicians love that even more. The food is good, although it's a tad on the expensive side and the portions are huge. They don't do half-portions so I suggest sharing. Details: Piazza dei Mercanti, 30. Open from Monday to Sunday for lunch and dinner. Phone: 065816198; 0658331086. Outdoor dining available. Reservations essential. Here is another of the Trastevere restaurants a bit further out on the edges. But it's worth the trip. La Maruzzella is a well-kept secret for where you can get some of the best carbonara in Rome! We love to get the Roman classics, but sometimes there is an interesting twist on them. And they have seriously delectable appetizer choices, both fish-based and meat-based. 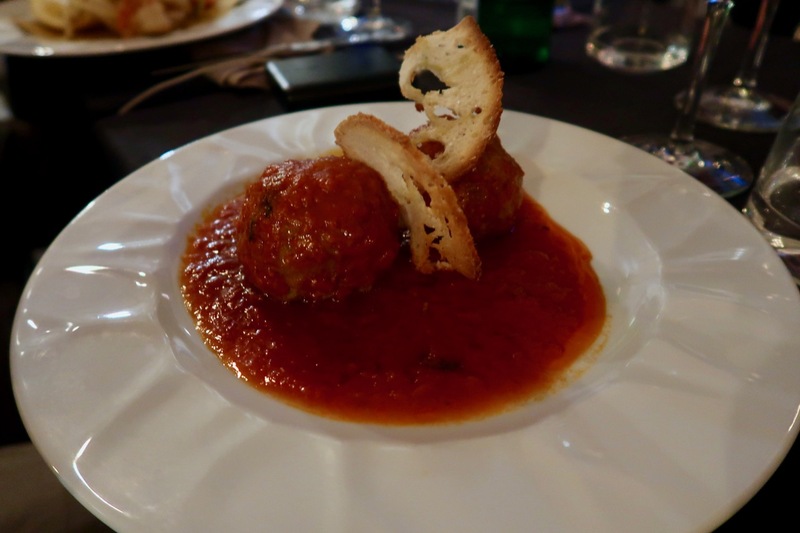 At La Maruzzella, one of the Trastevere restaurants a bit further out, you can enjoy "polpette al sugo", meatball in tomato sauce. A Roman classic made to perfection! By the way, don't miss the olive oil. The owners are from a small town outside of Rome called Sacrofano, and that's where the olive oil is from. It's divine. One important caveat - I've read some mixed reviews about their treatment of tourists, and the possibility they charge an arbitrary "service charge" only to tourists. This is a HUGE no-no in my book. Since it did not happen to me or anyone I know, and since those reviews were published some time ago, I am hoping they do not do this, or don't do it any more if they did do it. I am including them on this page because I remember the food being good, and, it's a beautiful setting to dine in, especially when you can eat outside, right in front of the church of Santa Cecilia. So use your judgement, and pay attention to the final bill. We used to go to Roma Sparita a lot. I have not been in recent years only because there are just so many places in Rome I want to try, and some others have become faves, so I kind of lost track of this one. This restaurant has always been famous for their cacio e pepe, in particular because it comes in a cute and delicious parmesan bowl. At one point Anthony Bourdain talked them up. So it became a little overly-popular and even harder to get into. So you definitely need to reserve. The food is pretty traditional. As an example, my English friend was aghast when they told her she could not order a side of potatoes because they were not traditional Cucina Romana. Details: Piazza di Santa Cecilia, 24. Open from 12:30 to 14:30 and from 19:30 to 23:30. Holiday closings: From August 13th to August 31st. Annual openings: From September 1st to May 30th: Monday closed all day and Sunday evening. From June 1 to August 30: closed Sunday all day and Monday for lunch. Phone: +39 06 580 0757. Outdoor dining available. Reservations essential. This may be one of the simplest of the Roman trattorias in Trastevere. There is not much of a menu, but what they do serve is basic, tasty Roman food. They have tables outside, although it can be a bit cramped. But it's worth it to come enjoy a pleasant, no-frills meal in the heart of Trastevere . . . and one that won't break the bank! When the pizza does not sit in a dough ball in your stomach after you eat it - that's good pizza. Proloco Trastevere is more than a pizzeria, it's a wonderful experience for savoring quality products from Lazio (the region of Italy that Rome is in). But if you do go for the pizza, beware. It's seriously addictive. La Fraschetta is another one of the Trastevere restaurants that serves up hearty Roman cuisine but also has a pizza oven. Details: Via di S. Francesco a Ripa, 134. Phone: +39 06 581 6012. Open Tuesday - Sunday for lunch and dinner; Monday for dinner only. No outdoor seating. Reservations suggested. Dar Poeta is one of the Trastevere restaurants on many guidebooks' and blog lists. There is a reason. And there is a reason you will almost always see a huge crowd standing outside waiting their turn. The place is not that special in terms of ambiance or decor. In fact, it's hectic and crowded. And you will not spend time lingering over a leisurely dinner here. But you will enjoy a perfect thin, crispy, slightly burnt-on-the-bottom Roman pizza. Pizzeria Ai Marmi (actually called "L'Obitorio") is THE quintessential pizzeria in Trastevere. You cannot reserve here. Just show up and wait like everyone else. The turnover is fairly quick, which also means you will eat fairly quickly yourself. It's all part of the experience. Just come for the excellent, thin Roman-style pizza, the delicious supplì (rice balls), and crispy fried baccalà (salt cod in batter). La Renella is a bakery making fresh hot pizza by the slice, right on the spot. You can get some other things here, like sandwiches and even some sweets, but the real star is the pizza. Point to the ones you want, and they will weigh them, heat them (if you want), and serve them to you on a tray that you'll take to the counter to eat. Fast-food pizza but the very best kind. Seu Pizza Illuminati is the latest and possibly the most popular pizza place in Trastevere if not all of Rome. While not in Trastevere proper, I am including them here because they are pretty close to Trastevere, and considered one of the hottest Trastevere restaurants right now. Details: Via Angelo Bargoni, 10-18. Open from Wednesday - Monday 7pm–12am. Closed Tuesdays. Phone: +39 06 588 3384. Reservations essential. Osteria der Belli is one of my favourite places to eat seafood in Trastevere if not all of Rome. Thanks to my friend Maria Pasquale, who publishes the blog Heart Rome, and who also recently published a book by the same name, for turning me on to this place. It’s really amazing that it’s literally a stone’s throw from one of Trastevere’s most touristy/visited squares, Santa Maria in Trastevere, and yet it’s actually a very local spot. Sardinian owner Leo is always on hand, keeping a watchful eye on the hive of activity as the waiters (many of whom are his family members) expertly serve a full house and manage to keep it all flowing. Their outdoor dining area is also one of my favorites, as it’s not on a heavily trafficked street, it’s sitting on a nice sturdy platform, and it’s covered. It’s also huge, which means you can easily bring a large party for a delicious seafood meal. Le Mani in Pasta is one of those Trastevere restaurants on a lot of lists. The name means "hands in the pasta", presumably denoting the homemade kind. Tagliolini allo scogilio - fresh pasta with shellfish, is one of my favorite dishes at Le Mani in Pasta. In any case, that is my favorite thing about coming here - the pasta, which is really excellent. Their seafood is also good but I always go for the pasta (with seafood). Details: Via dei Genovesi, 37. Open from Tuesday to Sunday for lunch and dinner. Closed Mondays. Phone: +39 06 581 6017. Reservations a must. No outdoor dining. La Gensola has long been considered one of the best Trastevere restaurants for seafood. This Sicilian osteria offers some harder to find products like sea urchin and monkfish cheeks. The ambiance is more serene and relaxing than most typical bustling Trastevere restaurants. You can count on high quality seafood but you should also expect fairly high prices (40-60€ pp without wine.) You will also find some meaty, Roman dishes, but I’d suggest fish as that’s what they are best at. Details: Piazza della Gensola, 15. Open daily for lunch and dinner. Phone: 06 581 6312. Reservations a must. No outdoor seating. Litro came on the hipster foodie scene a few years ago as one of the cool places on the block, serving bio foods and natural wines. But it's not all gimmick. The place is cute, the food is very good, and yes, you can find natural wines (among others). This is another of the Trastevere restaurants not actually in Trastevere proper. It's high up on the Gianicolo near the American University in Rome, but it's fairly easy to get to on public transportation. Details: Via Fratelli Bonnet, 5. Open from Monday to Saturday 12:00pm - 3:30 pm; 6:00pm - 12:00am. Closed Sundays. Phone: +39 06 4544 7639. Outdoor seating available but it's kind of closed in and will be pretty smoke-filled. Osteria Fernanda has recently moved to their new location - a bright and cheery spot in the Porta Portese area of Rome. This puts it just outside the main Trastevere neighborhood. But, t as with the other Trastevere restaurants on this page in this area, I've included it because you should make the effort. Spaghetto B. Cavalieri at Osteria Fernanda - My friend and I shared this dish, so it's a half portion of spaghetti with burnt eggplant, coriander and pistacchio, topped with red shrimp tartare. Absolutely divine! While ambiance is nice, what counts of course is the food. And if you're up for trying truly original things, Chef Davide Del Duca will delight you with his extremely creative dishes. Don't want to get that crazy? You can always get his most famous dish, bucatini all'amatriciana, along with some other classic Roman specialities. Rigatone Pastificio dei Campi at Osteria Fernanda - this was a half portion of rigatoni cooked in root reduction, topped with bufala mozzarella. Normally it is also topped with snails but we skipped that ingredient. But for me, the whole point of coming to Fernanda is to try something new, something daring and bold. The more adventurous you are, the more choices you have. I personally draw the line at raw meat but supposedly this is one of chef's best dishes. Orto e bucce at Osteria Fernanda - This appetizer of seasonal and local "greens and peels" was light but full of flavor. Even my vegetarian friend Livia was able to enjoy a lot of dishes here, so bring your taste buds and dive in! I loved the desserts but was also thrilled with this post-dessert presentation that included, among other treats, a traditional Roman maritozzo with whipped cream. The perfect ending to our lunch! Details: Via Crescenzo del Monte, 18. Open for Lunch: Wednesday / Saturday; Dinner: Monday / Saturday. Closed Sundays. Phone: +39 328 3847924. No outdoor seating. I'm including Eggs in the Innovative section of Trastevere restaurants because while they do serve an excellent carbonara, they also serve many variations on the theme, along with a lot of other eggy dishes. Eggs is NOT a breakfast place (Italians don't tend to eat eggs for breakfast). You will find a lot of different hearty foods made with some part of the egg, like this fried appetizer sampler, all made with egg or egg yolk. I love love this adorable little wine bar in the heart of Trastevere. It's very cozy and small, and they have a nice little aperitivo option during happy hour. The perfect spot for drinks before dinner. I often meet people at VinAllegro before dinner, and then it turns out, this becomes dinner. Vinallegro has a very cozy, convivial atmosphere. You can sit inside, sit in their spacious downstairs (they get full pretty quickly), sit near the window, or sit outside. First of all, they offer an excellent 10€ aperitivo bar. Besides having a pretty awesome antipasto bar, they have a menu with excellent choices, so you can really just turn an aperitivo into dinner. Which I tend to do here quite often. But they also have a regular menu too, and since you're already here sipping wine, why not just stay for dinner too? Freni e Frizioni is THE in place for aperitivo in Trastevere. Thanks to Livia Hengel for this beautiful photo of Freni e Frizioni in Trastevere. They are known for their excellent aperitivo bar (with superb vegetarian options to boot! ), and their hip and happening vibe. This is my personal favorite of the little Tratsevere bars to hang out in. It's small, cozy, comfy, and fun. And the bar staff are nice. I also love this side of Trastevere so for me, it's the perfect pre-dinner drink spot before heading to La Gattabuia or Da Teo. This tiny hole in the wall put craft beers on the map in Rome. It's small so just shove your way in and make your way to the bar to select from hundreds of beers. If you're not sure, let the bartender guide you. You cannot go wrong! Bar San Calisto is simply an institution. It may be one of the most iconic places to have a coffee in all of Trastevere. Almost any time of day, you can spot a gathering of local denizens playing cards, usually outside, and usually with one of their dogs by their feet. The fixtures are certainly from another era, giving you the sensation of stepping back into the "dolce vita" days. You'll find paraphernalia on the walls of both Rome soccer teams (Lazio and Roma), since one owner supports one and the other owner supports the other of these rival teams. Can you tell, it's one of my favorite places in Trastevere? For breakfast, I am of course referring to an Italian-style breakfast - cappuccino + cornetto (Italian version of a croissant), or some other hot drink + bakery item. Buongiorno! Details: Piazza di S. Calisto, 3. Open Mon - Sat 5:30am–1:30am. Closed Sundays. Baylon could also be considered a great place for an aperitivo. Some of my blogging friends hang out there for the excellent free wi-fi, but also for the vibe, which is usually pretty lively. The reason I put Baylon in the breakfast category is because this is one of the few places in Rome where you can get quality brunch type foods like omelets, pancakes, eggs, etc. And they have plenty of choices for the healthy-conscious eater, not to mention vegetarian/vegan options too. Details: Via di S. Francesco a Ripa, 151. Open daily 7am - 2am (so yes, it's also nightlife spot as I mentioned). No need to reserve. Phone: 06 581 4275. Outdoor seating available. Street food is not hard to find in Rome. You will find some version of it just about on every block throughout the city, especially in the touristic center. The three best spots in Trastevere for street food are Trapizzino, Suppli, and La Renella (which I listed in the pizza section above). Trapizzino as long become synonymous with superb Roman street food. These scrumptious pockets full of heaven are so popular, there are now branches in Milan, Florence, Turin, and New York City! While there are also several spots around Rome, one of the best-situated has to be the Trastevere branch, smack in Piazza Trilussa, night-life central. A huge plus - there is ample place to sit in the back. Buon appetito! While most people tend to look for casual eating at Trastevere restaurants, there are a few options for upscale dining. Osteria Fernanda (in the section about Innovative Trastevere Restaurants above) could fit into this category too. Glass was one of the first the Trastevere restaurants I consider upscale. It remains on of my favorites in all of Rome. We used to go a lot when they first opened, before chef Cristina Bowerman got her (well-deserved) Michelin star. Their prices went up a bit since they got their star, but the food stayed wonderful. The ambiance is perfect - subdued, warm and inviting. You could also consider it romantic. But of course, with me, it's always about the food. And that is the main reason to come. Details: Vicolo del Cinque 58. Open from Tuesday to Sunday from 7.30 pm to 11.00 pm. Monday closed. Phone: +39 06 58335903. No outdoor dining. Enoteca Ferrara is really three Trastevere restaurants in one. If you go in from Piazza Trilussa, you can enjoy the wine bar, complete with their fantastic aperitivo spread. I love how they conserve the wine in these ultra-high-tech containers that keep the air and temperature just right, allowing for many options for wines you can try by the glass. If you go in on via del Moro, you can enjoy fine dining at the restaurant Ferrara, or, chill out a bit at the more casual Osteria Ferrarino. No matter which you choose, you will eat and drink well! Details: Piazza Trilussa, 41. Open daily for lunch and dinner. Phone: +39 06 5833 3920. No outdoor dining. Antico Arco is yet another of the Trastevere restaurants on this page that is just on the edge of the neighborhood. But it's one of the loveliest restaurants in the area, and perfect for a quiet, special, more upscale dining experience. Details: Piazzale Aurelio, 7. Open daily from 12:00 to 24:00. Phone: +39 06 581 5274. No outdoor dining. You can’t come to Trastevere and not visit Valzani. If only just to breathe in the aroma. Family-owned since 1925 (and with the original fixtures to boot! ), this chocolatier is one of the best in Rome. You might be pulled in by the delectable treats on display in the windows. But once you open that door, and that chocolate aroma wafts over from the laboratory in the back, you will not want to leave. My favourite thing about Valzani is visiting in fall/winter and getting one of their hot chocolate cups. If you are a chocoholic, you must add this to your bucket list. Details: Via del Moro, 37a/b. Open Tuesday - Sunday: 10am - 8pm. Closed Mondays. Same goes for Biscottifico Innocenti. It's another Trastevere must. This is another longtime family-run business, and it’s on the other (quieter) side of Trastevere. And instead of chocolates, they do cookies. Boy do they do cookies! You can see the cookies from the street, but once inside, and you can see and smell them all, you will feel like you died and went to cookie heaven. You might be wondering why you should go to a French bakery when you are in Rome, Italy. Um, because it’s a French bakery. Eclairs. Croque monsieurs. Gallette du Roi in January. And actual butter croissants. Don’t get me wrong. I am always happy to have a cappuccino e cornetto. But (sorry not sorry), a buttery, flaky French croissant is more than I can resist! Details: Via Luigi Santini, 22. Open Monday to Saturday: 8am - 8.30pm; Sunday: 9am - 8pm. Strangely enough, the Trastevere gelato scene used to be slim pickings. The best was Fior di Luna. It’s still good, but now we also have Fatamorgana and Otaleg. Now, you have no excuse not to have a gelato when you are in Trastevere. My motto - a gelato a day keeps the doctor away. Fatamorgana was one of the first gelaterias in Rome to create truly artisanal gelato, made only with fresh, natural, seasonal ingredients. They also were among the very few that played with unusual flavors like Kentucky tobacco and Seadas (a Sardinian dessert made of cheese, orange peel, and fried dough). Luckily for all of us, there is a branch in Trastevere. So you can try all the flavors. Like I have. What can I say, it was research. Otaleg was already in my top 10 gelato spots in Rome. Close to the top in fact. And I used to describe them as a gelateria worth going out of your way for. But no more! Now they are in Trastevere and I can go as much as I want. Help! Details: Via di S. Cosimato, 14/a. Open daily from 12 to 24 during the months of June, July , August and September. Open daily from 12 to 21, Friday and Saturday from 12 to 24 during the months of May and October. Open daily from 12-21 November to April. Fior di Luna was once considered THE gelato spot in Trastevere, before Fatamorgana came along (and now Otaleg). It's got a prime location right on via della Lungara, where everyone strolls from the main throroughfare of Viale Trastevere towards the bellybutton of Trastevere, Santa Maria in Trastevere. But beyond location, Fior di Luna serves up some delicious gelato, in creamy nutty or fruit flavors. The perfect strolling accessory on a hot summer's night. It may not be quite as artisanal as Fatamorgana or Otaleg, but locals seem loyal to it, and I must say I love it too. Ask any foodie in Rome, and they will tell you, Antica Caciara is THE place to go in Trastevere for a sublime cheese experience. Open since 1920, the founder's grandson Roberto greets his clients every single day, and always with a smile. I come here often with friends and visitors, and much of the time, people browse, soak up the aromas and the atmosphere, and don't buy anything, and Roberto smiles just the same. But if you do get some cheese, guanciale, or even just a panino, from this little shop, you'll be transported into food heaven. This lovely local farmers' market is the perfect place to stock up on ingredients if you're cooking at home. Or, just take a wander through the stalls, and enjoy the colors and aromas of fruits and vegetables in season. Details: Piazza di S. Cosimato, 64. Open from Monday to Saturday 6.30am to 2.30pm. Closed Sundays. Run by 3 generations of the Iacozzilli family since the early 1920's, this deli is a Trastevere institution. Stop by and enjoy the sights but more importantly the aromas, and, if you're hungry, don't miss their porchetta sandwiches - to die for! Details: Via Natale del Grande, 15. Open from Monday to Saturday 9am–1pm and 4:30–8:30pm. Closed Sundays. Are you wondering why some of the internet’s favourite Trastevere restaurants are not on my list? First of all, there are literally hundreds of Trastevere restaurants and of course I don't know all of them. Many restaurants also come and go - as happens all over the world. But if we are talking about two Trastevere restaurants that are on many other food bloggers’ lists, well, I don’t engage in restaurant bashing, so I won’t name them here. But I will tell you why they are not here - the owners behaved VERY badly, and I’ll never go there again, nor can I recommend them to you. Any place I recommend on this website should be a solid place, where the management treats all their guests well, whether they are locals or not, friends of the owners or not. If there is any slight and forgivable variation to that, I’ll let you know. I am very forgiving of rude, scant, or aloof behavior by staff, as I know that staff can come and go, and also, service standards are different in Italy than they are in some other Anglo-Saxon countries. But out and out horrible behaviour by owner/management is just something I don’t put up with. If you ever get treated badly someplace I recommend, please let me know. Here's a map of all the Trastevere Restaurants I listed on this page. You can refine your search by using the left-side pop-out to select one or more types of cuisine.